We’d love your help. 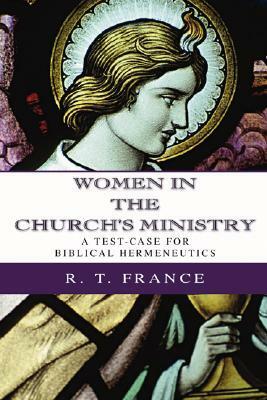 Let us know what’s wrong with this preview of Women in the Church's Ministry by R.T. France. To ask other readers questions about Women in the Church's Ministry, please sign up. Seldom have I read such a clear, enjoyable book with which I disagree! Every sentence is packed with meaning, yet reads with joy and light. Reminds me of C. S. Lewis! It’s hard to believe that anybody still believes women should not be pastors, and harder to imagine that anyone, after reading this book, could hold onto that position. France does a great job of addressing the particular issues carefully, and gives a good introduction to how to approach the Bible hermeneutically, with a wider scope to its values. From the assumption that Scripture is the “supreme authority in all matters of faith and conduct,” (13) he lays out the texts that traditionally deny It’s hard to believe that anybody still believes women should not be pastors, and harder to imagine that anyone, after reading this book, could hold onto that position. France does a great job of addressing the particular issues carefully, and gives a good introduction to how to approach the Bible hermeneutically, with a wider scope to its values. From the assumption that Scripture is the “supreme authority in all matters of faith and conduct,” (13) he lays out the texts that traditionally deny women’s ordination, especially 1 Cor 14:34-35 and 1 Tim 2:8-15. With close reading and fair critique, and without saying so quite blatantly, it becomes clear just how weak the anti-ordination proof-texting case is. Some verses are irrelevant to ordination, others to authority. On the other hand, commentary on Galatians 3:28, as a culmination of liberation theology (22) or as a response to a terrible temple prayer (90), is quite convincing support. This study could just as easily be written about gay ordination, environmental stewardship, or any Scriptural interpretation in modern times. It is fair, not nearly academic and clever presentation. This short book gives a basic overview about how to hold to a high view of Scripture while at the same time how to move from a 'traditionalist' interpretation on gender roles to a more 'egalitarian' view. France writes from an Anglican position, and while it may not go in depth (it is only 96 pages) on some of the thorny exegetical problems, he looks at Scripture as a whole and seems to use a 'trajectory' interpretive model to point towards a more open position on women in the priesthood. While This short book gives a basic overview about how to hold to a high view of Scripture while at the same time how to move from a 'traditionalist' interpretation on gender roles to a more 'egalitarian' view. France writes from an Anglican position, and while it may not go in depth (it is only 96 pages) on some of the thorny exegetical problems, he looks at Scripture as a whole and seems to use a 'trajectory' interpretive model to point towards a more open position on women in the priesthood. Useful. Interesting reading it. Felt like the CofE in 1995 (when the book wasublished) was at the same stage in debate as the CofS was at in the 60s. Richard Thomas France was a New Testament scholar and Anglican cleric, and Research Fellow in the Department of Theology and Religious Studies, University of Wales, Bangor.